In 1973, Madhur Jaffrey’s cookbook, An Invitation to Indian Cooking, introduced many Americans to the world of Indian cuisine. Since then, Jaffrey has penned dozens more cookbooks and evolved her work as Indian food has become more familiar to Americans. This May, she releases her latest work: Madhur Jaffrey’s Instantly Indian Cookbook: Modern and Classic Recipes for the Instant Pot®. Priya Krishna is a food writer for The New York Times and Bon Appetit. Her forthcoming first cookbook, Indian-ish: Recipes and Antics From A Modern American Family, includes many classic recipes. But Krishna also tears down the walls between Indian cuisine and the many other cuisines that have influenced her. How exactly does an immigrant cuisine assimilate? When it does, what compromises are made? What’s gained and what’s lost? What does this process tell us about the way immigrants themselves assimilate? And where does the cuisine go from here? 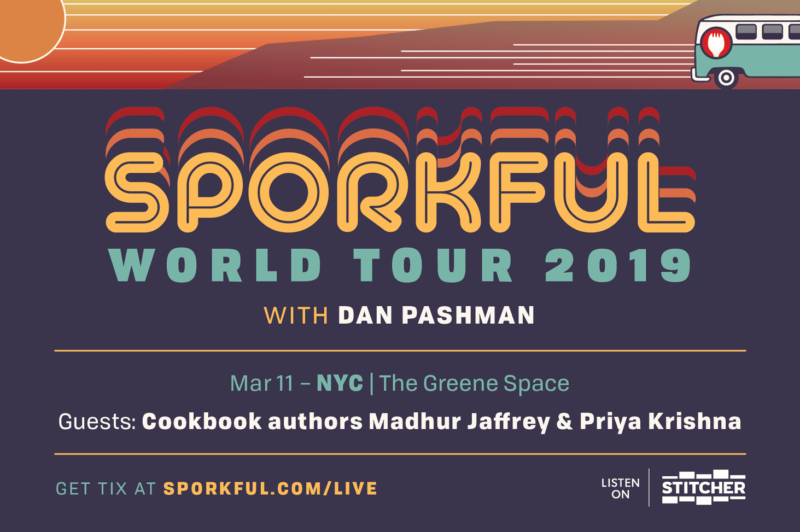 Join us for this special live taping of the James Beard Award-winning food podcast The Sporkful, featuring Jaffrey and Krishna, and hosted by Dan Pashman.